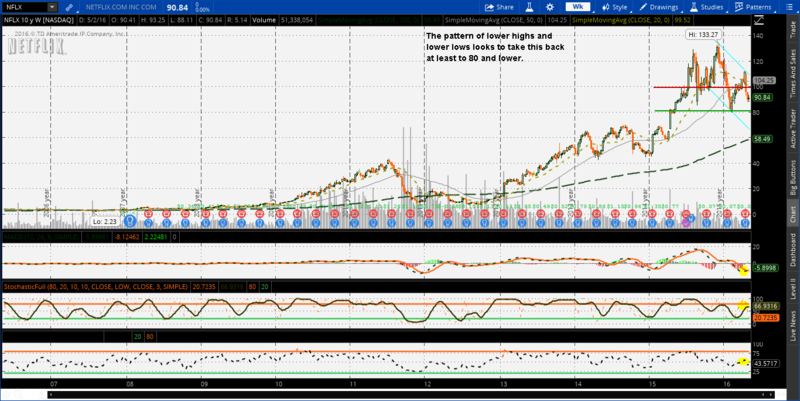 Update 5/15/16 – Netflix has broken 90 as the chart has shown it could do. The support level it may likely seek is in the lower 80’s. It is testing out is most recent lows and may push a little lower before it bounces. It may find its range in the 80-90 area. Update 5/9/16 – Netflix has been fairly consistent on its chart with showing that moves over 100 can get crazy and that when it dips back below, its a range bound stock. It is back below 100 and showing that it can move to 80 again as 90 has not been very strong support in the past. If it reaches 80, it may very likely move lower. Update 3/3/16 – Netflix followed its recent move with another sell into strength. The 50 day has been this stocks crutch for its moves higher and may likely be on the opposite side of the fence. The trend is still very strong. Now it has formed an inside day formation and that could also be a signal for it to move lower. Update 3/1/16 – Netflix still hanging. Resistance has pushed the stock back and it may start to resume its move lower again to retest 90 support. This one has done its norm by just hanging around and may start to continue its trend.